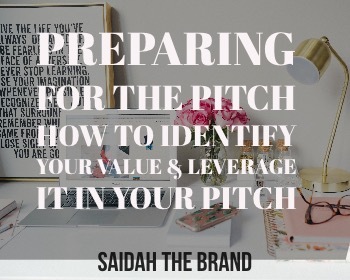 So your ready to pitch, you know what brand you want to reach out to, but you don't know what value your value is or how to explain it in your pitch. Whether you have a small or large audience, the receiver of the pitch has to understand the benefit of a partnership with you. Explaining and highlighting those benefits is what you'll learn in this module. I'll teach you how to identify the best parts of your brand so you can make them shine when you write your pitch. "I took Saidah' s pitching class. It was the best thing I could have done. She gave us so much information and helped us with any questions we had. I have been pitching so many companies with a newfound confidence to do so. I was so nervous to pitch companies prior to taking her class. I just didn't know how to correctly go about it. It was the main reason in taking her class. I am so happy I did and do not regret it one bit. I am saving up to take purchase her blog audit next". Tap the buy now button to get started!